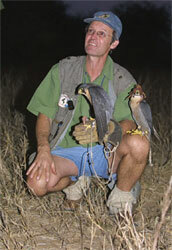 Ron Hartley's incredible passion and commitment to raptors in general, and falcons in particular, drove the Zimbabwee Project (a partnership with the Zimbabwe Falconers' Club) to unprecedented levels of success in raptor research and conservation, and training of enthusiastic young falconers and biologists. Ron was one of the most vibrant, energetic people we have ever known. His death is a tragic loss to all of us, both professionally and personally.